Virgil Leroy Towne departed this life 10:00 A.M. 13 August 2018 at Senior Living Choices. Curtis Nebraska. He was 101 yrs, 2 mo, 11 days old. Virgil was born to William Edmund and Jessie Jane (Barry) Towne on 2 June 1917 at the Barry Ranch in Southern Lincoln County, Nebraska. Around 1922, the family moved to their new farm on Brushy Creek between Maywood and Curtis. Virgil attended the Viaduct School until eighth grade. He farmed with his father and older brothers for a couple of years until he struck out on his own. He spent the summer of 1936 ranching for Swiggart in Grant County, Nebraska. 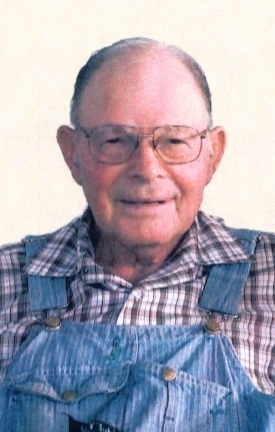 After that, he and his brother Lawrence started farming together in Frontier County. When the war came, Virgil was in the second draft and ended up in the 159th Infantry. From April 1942 until September 1944 he was stationed at Dutch Harbor, Aleutian Islands, Alaska. His unit was pulled from Alaska to be transferred to Europe as replacement troops and he arrived in France in March of 1945. Fortunately the war was ending so he was involved in guarding German prisoners of war. He returned to New York City on 3 November 1945 and was discharged at Ft. Leavenworth, Kansas on 9 November 1945. He earned the Expert Infantry Badge, the Good Conduct Medal, and was issued the Honorable Service lapel button. Virgil was a 60 year member of the American Legion, Carl Heath Post 95, Curtis, Nebraska. He returned to the Maywood and Curtis area and resumed farming with Lawrence. Over the years the two brothers farmed at various locations in Frontier County until they could begin purchasing their own land. By 1970 they included their brother Leland in the farming operation. They farmed until 2013 when Virgil was 96 and age got the better of them. They stopped actively farming and leased their operation. On 22 February 1967 Virgil and Edna (Davis) Christensen ran off to Burlington, Colorado to get married. That was Washington's Birthday so the courthouse was closed. Edna and Virgil had to spend the night with JoAnn. Edna had raised her daughter properly so Virgil had to spend the night in a hotel until the courthouse opened on 23 February. They were happily married for 41 years until Edna's passing in 2008. Virgil has led a full and good life. He is survived by two brothers, Leland of Grand Island, Nebraska and Harold "Bees" of Louisiana, Missouri; three loving stepchildren, Roberta Christensen of Denver, Colorado, JoAnn Sortore of Denver, and Jim Christensen of Curtis, Nebraska; seven grandchildren Michael, Jerry, and David Miller; Soren Goldstein and Ilana (Goldstein) Lutz; Kristen (Harwick) Poland and Craig Harwick. He is also survived by 11 great grandchildren and 14 nieces and nephews. He was preceded in death by his parents, three sisters, Rowena Burton, Verle Nelson, and Georgianna Ervin, and six brothers, William, Lawrence, Max, Melvin, Floyd, and Leonard and two stepdaughters, Betty (Christensen) Goldstein and Phyllis Christensen. Visitation will be held at Blase-Wetzel-Strauser Memorial Chapel, Curtis, Nebraska; Friday, August 17, 2018, 4:00 pm - 7:00 pm. with the family present from 4:00 pm - 6:00 pm. Funeral services will be held at First United Methodist Church, 402 Center, Curtis, NE, Saturday, August 18, 2018 at 10:00 am with Pastor Tunde Oladimeji officiating. Interment will follow in the Maywood Cemetery, Maywood, Nebraska. In lieu of flowers please consider a donation to Senior Living Choices or the Frontier County Ambulance in Curtis, Nebraska.